Plant-based partiers, Vegan Nights, took the carnival vibe to the max in celebration of V For's launch. 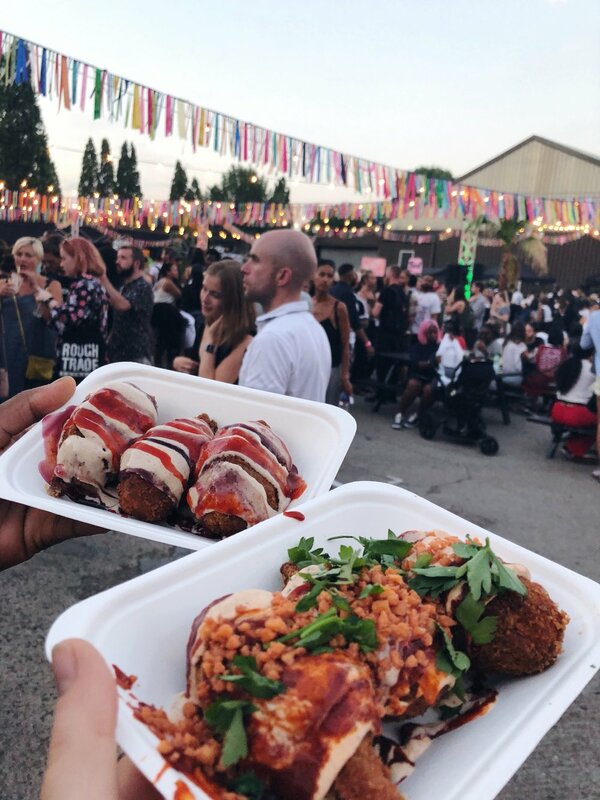 The established eventers expanded the v-fest allowing two thousand cruelty free food fanatics to treat themselves & the planet in the midst of a London icon: the Old Truman Brewery. So, what is V For? V For is the brains & braun behind a month long series of vegan & conscious living events running throughout August in East London. Head here for the complete month-long schedule. Long gone is the dusty version of veganism, and Vegan Nights & V For... are testament to that as they bring together vegans, veggies & the V-curious to eat, drink, & be merry. To try new things, educate each other, & basically be the holy grail of all things plant based. For the record, I'm vegetarian. Have been for about 5 years now & despite a couple of stumbles in the early months, I've never looked back. I've dabbled with veganism but it never stuck 100%. The 6 months I went all in turned out to be an incredibly difficult time personally and worrying about my diet dipped down on my list of priorities. For others who are V-curious, just like me, I urge you to visit V For... during August, and the next Vegan Nights in September. Okay, now, let's get down to business. How was the night? What on earth did we eat? The answer: everything! I definitely needed to be rolled home. So, here goes. The Old Truman Brewery is a fitting location given how open & bright the yard is, the icon has been given a modern lick with street art from the likes of Ben Eine (legend), fairy lights & a carnivalised warehouse. All in all, stepping into this world forces you to check any woes at the door allowing you to fully embrace the positive, happy vibes within. And so began my very first Vegan Nights. After some horror on the tube subjected fellow travellers to Pickled Onion Monster Munch on a rush hour District Line, I was really worried my appetite was gone forever however as I crossed the threshold into the carnival lights, Vegan Nights descended me into a whole world of yum. The deck of vendors on hand to fill my tum was vast so whittling down dinner choices was not easy but, you know, challenge accepted! Temptations from Cook Daily, Hippie Turks, & Dope Soft Serve were merely the tip of the iceberg so Jamie & I went for gold, doubling down but going splitsies. First up, The Green Grill. It has been an age since I had a proper hotdog, not that it's something I ever frequently indulged in but still. The Green Grill came up trumps with their Classic and the Carni Dogs. Sprinkles of damn crunchy onions & lashings of American mustard & ketchup took me to the ball game, the latter loaded with plantain, jerk & salsa verde. Both housed in a gourmet bun & both insanely good. Next up to the plate were my boys Biff Jack's Shack. Their juicy jackfruit keeps me coming back but this time, this time was different. Two new wings were on the menu: the Jelly Jack & The Bacun Chipotle. DAYUM! I don't even know what else to say, these life-changing bites have changed my life. If you see BJS at an event, you'd best get in line. Most likely behind me! Working off the wings with wine, having a boogie and chatting to lifestyle vendors at Self Care Co. and Ethcs but the allure of Froconut was too much to not cave for. 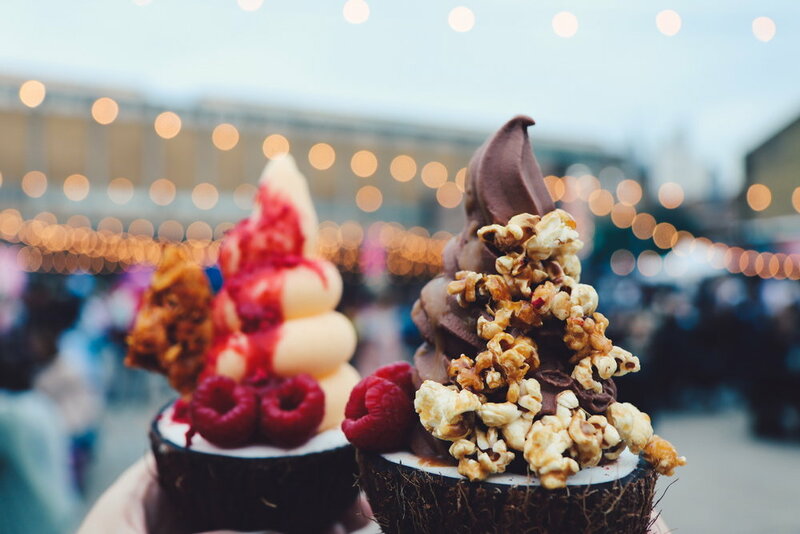 Froconut's soft serve in half coconut shells are as beautiful as they are delicious. I love honey so obviously the Crunchie was my only possible choice. I had to have it and it was the best decision I have made in my entire life. Want to come to the next one? It's Vegan Nights 1st birthday on September 6th so get over to their website for the 411 & to pick up your early bird ticket for a fiver. See you there!